Wow, SBINZ is a quarter of a century old. How about that! 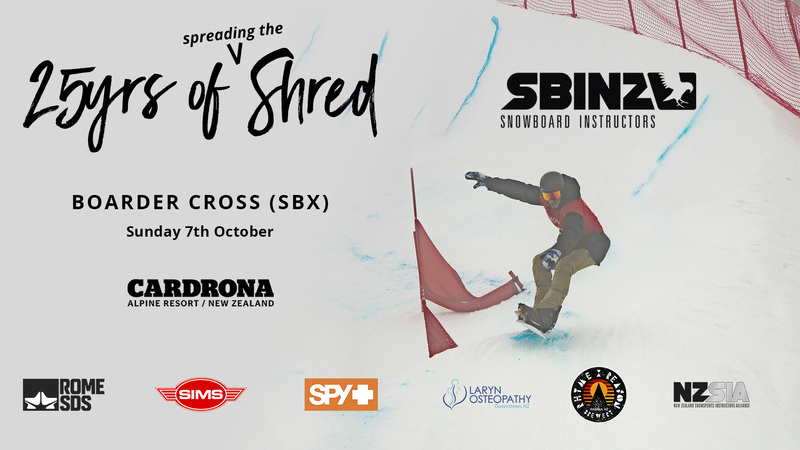 So we’re celebrating with an old-school style boarder-cross race at Cardrona (where our first ever course was held in 1993), that will be FREE for anyone who’s a current member of NZSIA/SBINZ and for all those who have been members in the past too. And to show their full support for the event, Cardrona are giving away a 2019 season pass as a spot prize too! This is a participation-focused event, so everyone who enters will get multiple runs with plenty of banter to accompany you down the course. Everyone MUST pre-register – you can do so here (minimum age; 18 years old). But the divisions don’t stop there, you can enter as a team too! This is an extra special division with one-off prizes from us here at SBINZ and from the awesome brewers at Rhyme and Reason Brewery. Each team MUST have at least one person in each age category and a female (with 3-5 people total). The winning team will be announced at the after party and will be done on a points system, based on how far each team member goes on the day. Every team member still enters as an individual too; the team event is just a way to bridge the generation gap. But don’t worry, if you haven’t got a team to join by the time you register, we’ll be slipping people into teams on the morning of the event too. There’s a whole lot of prizes from our awesome sponsors and a bunch of extra swag to give away, so get involved and pay homage to the 25 year history of snowboard instructing in New Zealand. Registration: Free to any current or past member (no other entries allowed), 100 people max. Register here.